On the plus side, the on-pitch attributes of Shikabala are entertaining for Egypt's demanding supporters, who are known for their passion for attractive football. Characterised by his dazzling tricks, neat footwork and goal-scoring instincts, the lively forward is a prized asset for his club and national team alike, with opposing defenders usually mulling their options before deciding on a tackle that might leave them blushing with embarrassment if they are beaten. "Shikabala is the best player in Egypt," Ismaily coach Mark Wotte said, picking him ahead of his own side's playmaker Abdallah El-Saied, who also grabbed headlines with a series of impressive displays. "His very special skills win games for Zamalek. 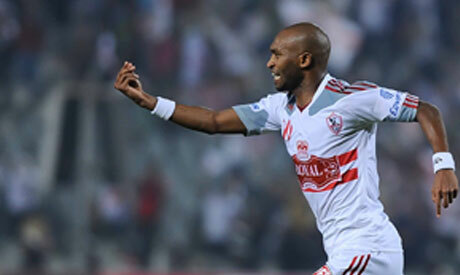 Shikabala is the most skilful player in Egypt." The 24-year-old took the Egyptian Premier League by storm this season, constantly leaving opponents trailing in his wake as he helped Zamalek move to the top of the table, ahead of arch-rivals Ahly. He is the League's joint top scorer, his eight goals including memorable strikes against Ittihad El-Shorta and Alexandria-based club Ittihad. However, Shikabala has another side which seems to constantly let down his enthusiastic supporters. Although Egyptian coach Hassan Shehata voiced concerns over certain aspects of Shikabala's game a few months ago, he included him as expected in his squad for a friendly game against Australia in November. But a few days before the match took place in Cairo stadium, the talented schemer apparently sustained a back injury during a League game which Zamalek said would prevent him from playing against Australia. He also declined to join Egypt's training camp and be examined by the team doctor, fuelling speculation that he wanted to skip the game, which coincided with the Islamic Al-Adha feast, on purpose. "This is not the first time Shikabala has done this. When he fell onto the ground (in the league game) against Ismaily, I know why he did that," the disgruntled Shehata was quoted as saying by local media. "He is the only one who will lose because of such an attitude, but the door will be open for him if he acts well in the future." Shikabala's track record is filled with disciplinary problems. Shehata has also accused him of feigning injury to skip Egypt's opening game in the 2012 African Cup of Nations qualifiers at home to Sierra Leone, held last September. A media-shy player, the former PAOK man did little to quell doubts over his commitment and was eventually left out of the Egyptian squad for another friendly against Qatar this month. He was part of the Egyptian squad for their triumphant Nations Cup campaign last January but made only one appearance, after apparently paying the price for a heel flick which did not go down well with Shehata. More controversy was to follow in the domestic League, with Shikabala being videotaped chanting offensive songs against Zamalek's arch rivals Ahly while celebrating a win with the White Knights' jubilant fans. "I have not retired from international football; I'm still 24 and I have only played one game for Egypt in a major tournament," said Shikabala who made his international debut on 3 June, 2007, against Mauritania and has only played 11 matches since then. It seems a waste that such an immense talent who had the ability to become one of Egypt’s and even Africa’s deadliest threats, has so far failed to make his mark on the international scene. "Playing at the international level is an honour for any player. I'm fully ready to join up with Egypt as long as I'm fit." Egyptian assistant coach Shawky Gharib said recently there was still room for Shikabala but it remains to be seen whether he would be able to shrug off his “bad boy” image and return to the Pharaohs' fold. So far, Shikabala has only seemed able to overcome his problems and live up to his potential when playing at club level. Time will tell whether he can follow suit in the international arena and carve out a successful career with the Pharaohs.